Alex, Inc., a show about Zach Braff holding microphones at various distances from his face, is not a particularly compelling sitcom. Sure, there are moments when you wonder whether Braff’s podcast career slash midlife crisis will succeed, but it all ticks by without much to draw you in. Yet, there is one clear highlight: Tiya Sircar, an actress you might recognize from The Good Place and Master of None, plays Braff’s wife. Even while consigned to this secondary (or really, tertiary) role, she manages to be engaging, charming, and funny. Forget the podcasting, it’s time to give Sircar a show of her own. 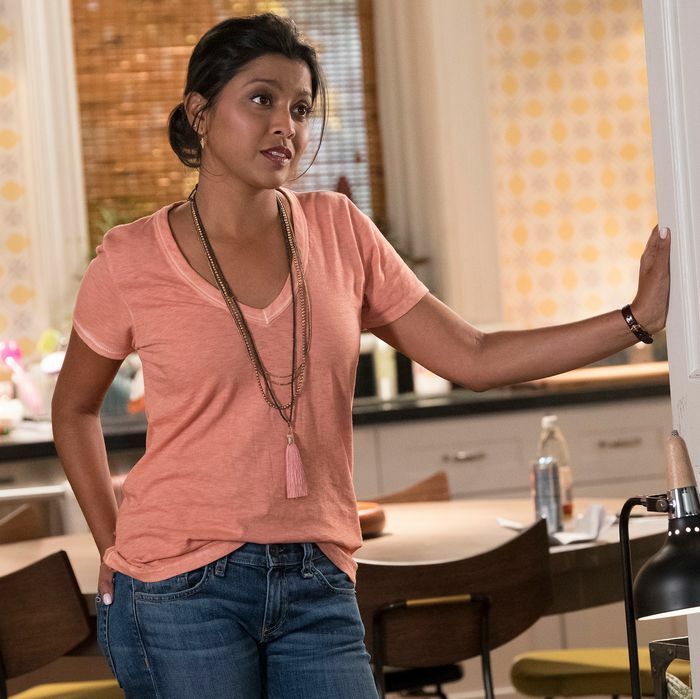 On Alex, Inc., Sircar plays Braff’s cheery yet suffering wife Rooni, the kind of character the show is smart enough to not make a total scold, but not smart enough as to give much other direction. She smiles at her husband over humongous TV breakfasts, wears trim blazers, and offers key advice whenever she’s not distracted by her kids or her job as a lawyer. Even in the scenes when her character’s primary motivation is about her kids wearing bad costumes, Sircar invests humanness and charm into her performance. It’s certainly possible that Sircar’s role in Alex, Inc. could grow over the course of the season (and it should), but it’s too bad she hasn’t gotten more of a showcase yet, given how much she’s been able to do elsewhere. On The Good Place, specifically, she shifted from playing the “real Eleanor” – a too-good do-gooder who turned out to be a plant to torture Kristen Bell’s Eleanor – to playing demonic Vicky with ease. On that show, Sircar delights in Vicky’s evil schemes, especially her predilection for trying out accents she absolutely cannot pull off. (In one scene, she tries on an Australian persona and it comes out sounding vaguely like act one Eliza Doolittle in My Fair Lady.) Vicky has a wacky and yet terrifying energy, which Sircar brings out with upbeat menace. In a show full of standout performances, she more than holds her own as a guest player. There’s no saying where the The Good Place might go next season, but it would be do well to bring her back as much as possible. Or — and hey, this is just an idea! — someone should just give Sircar a lead role in her own show. Maybe it’s a spinoff of The Good Place where Vicky just schemes a lot and tortures people (would watch!). Maybe it’s a revision of Alex, Inc. where she takes over and starts her own podcast about how annoying her husband’s podcast is (maybe too meta, but still!). Maybe it’s an entirely different show that has a solid, complicated, and funny lead role for her. The point is, Tiya Sircar has more than proved her value, so someone please go for it. Until then, I will begrudgingly keep watching Alex, Inc. – if not for Sircar, then because those giant breakfasts really do look good.